Serious hobbyists and professional aquarists routinely monitor various chemical and physical parameters within their aquaria, and for good reason. Substantial investments in livestock and equipment are often under their charge and consequences of lost of livestock and displays could range from serious to cataclysmic. Recently available equipment would be of use to these folks. Since these instruments are ‘lab grade’, they would be of potential use to research scientists as well. Specifically, this article will examine some relatively new technology found in the ‘HQ’ meter series offered by the Hach Company and will explore various applications. These meters are offered in different configurations and offer potential cost savings over individually purchased instruments. First, we’ll examine each of the meters within the HQ series, and the parameters for which they can check. Though advanced hobbyists will be familiar with the terminology, some readers might not feel comfortable with terms such as dissolved oxygen and conductivity. These readers can review the Definitions section at the end of this article. Hach (rhymes with Bach) is a well-established firm that has supplied the water and wastewater industries with ‘cookbook chemistry’ procedures and analytical instruments for years. Many of their reagents and instruments are capable of producing results acceptable to the U.S. Environmental Protection Agency. The Hach HQ series falls into this category. The EPA approved Method 10360 (luminescent dissolved oxygen procedure) on July 26, 2006, while the electrode methods for pH and conductivity have been approved for years. You should note that the HQ meters are not compatible with probes other than the Hach IntelliCAL™ series. Probes with BNC connectors, for example, will not fit the meter’s connections. Figure 1. A macro shot of the HQ40D’s display. Red lettering explains the meaning of each. Note that the two DO probes were in different samples that resulted in differing recorded values. The HQ40D is the flagship of the meters in the HQ series. With appropriate probes, it has the capability to measure any two (or two of any one) of these: Dissolved Oxygen, pH and Conductivity (including Salinity and Total Dissolved Solids). The HQ40D also has the ability to store data directly on a memory stick or to a computer through a USB port when used with AC power. When running on batteries, the data records are stored in the meter’s internal memory for later download. The HQ40D comes standard with a field kit which includes a protective glove for the meter, wrist cord, 5 sample bottles and probe holders (standard probes only) all of which are housed in a sturdy plastic carrying case. This meter is similar to the HQ40D but lacks the ability to simultaneously monitor two electrodes. If you’re looking to monitor DO, pH or conductivity independently (with the purchase of appropriate probes), then this meter could be your answer. The HQ30D lacks the ‘instant download’ to a memory stick or computer as seen on the HQ40D. The HD30D does not include the carrying case, wrist strap, and other items that are standard with the HQ40. The HQ14D is for use only with the Hach IntelliCAL™ digital conductivity probe. Up to 500 data records are stored in the meter’s internal memory which can be manually entered into a spreadsheet. Exactly as described for the HQ14D meter (above) but for use only with the Hach IntelliCAL™ pH probe. These Hach meters are powered by 4 ‘AA’ batteries (standard alkaline batteries are supplied with the meter). Though Hach also recommends use of rechargeable batteries (nickel metal hydride) and an associated charging device; neither is offered as an option available through the company and must be purchased independently. Battery life is very good. Hach says 200 hours on a set of batteries is normal. This statement seems to be correct. (Note: Hach does not recommend mixing alkaline and rechargeable batteries in the meter). Hach does provide an AC power transformer with each meter, so simply plugging the meter into an electrical outlet is a viable option. Use AC power only with a ground fault interrupter (GFI) outlet as the adapter is not waterproof. The unit’s power supply does not recharge the internal batteries. Any one of five languages is available for the meter’s display. These include English, Spanish, German, Italian and French. Options on time include a 24-hour (military) format or AM/PM. Five options are available for the date display. It is important to note that time and date must be correctly set before connecting the probe(s). The probes are time-stamped by the device at first use and are so marked for warranty. In addition, the meter will advise the user of recommended annual DO probe maintenance. Traceability of ‘who and where’ is important in parameter measurements involving chain-of-custody or other critical procedures. To this end, Hach includes various programmable options for sample and operator identification. (See Figure 1). True to their nature of being field units, Hach HQ meters are capable of operating in harsh temperatures (0-60°C, or 32-140°F) and humidity (90%, non-condensing). Although the meter itself can withstand hot temperatures, the range of the dissolved oxygen sensor limits practical analyses to a slightly lower temperature (50ºC, or 122ºF). All probes are available in two models – standard and rugged. The standard models are made of plastic, are smaller in size and have smaller diameter cords. Cords are available in 1 and 3 meter lengths. The rugged probes are robust, made of stainless steel and plastic (see Figure 2) and are available with lengthier cords. These are larger than the standard probes and more suited for field work. ‘Rugged’ probes can be custom built with non-standard cord lengths. Unless the application is really severe, the standard (and lower priced) probes should be suitable for work in aquaria and ‘wet’ laboratories. Figure 2. Probes for the HQ meter series. From the left, a ‘rugged’ DO probe, a standard DO probe and a standard pH electrode. It is important to note that the probes are resistant to water intrusion for a period of 24 hours when fully submerged (the sensing portion of the probe can be immersed indefinitely). The probes are, of course, made to test liquids but have differing water resistance once fully immersed. The ‘standard’ gel-filled pH and DO probes are fully submersible in water up to a depth of 3 meters for 24 hours; ‘rugged’ probes are built to withstand pressures of 30 meters for 24 hours. The refillable ‘standard’ pH probe is limited to immersion by the refill hole on the side of it (an effective depth of about 10 cm). According to Hach, the meter itself is submersible to a depth of 1 meter for 30 minutes, however, the battery compartment is not waterproof can take on water after 15 seconds at a depth of 0.64 meter (~2 feet). Obviously Hach has attempted to make its HQ meters survivable to accidental spills in wet environments, and intentional submersion is not recommended. Access to instrument use and stored information can be protected with a password, if desired. Passwords can be up to 12 characters long (including A-Z, 1-9 and spaces). Data logging is a valuable function of the HQ series. Hach sells its products short when it advertises that ‘only’ 500 ‘data records’ are stored in the meter’s internal memory. They should state that 500 ‘data sets‘ are retained, meaning that for each, say, dissolved oxygen reading, these parameters are stored: Dissolved oxygen, temperature, oxygen saturation in percent, and time and date of the measurement. 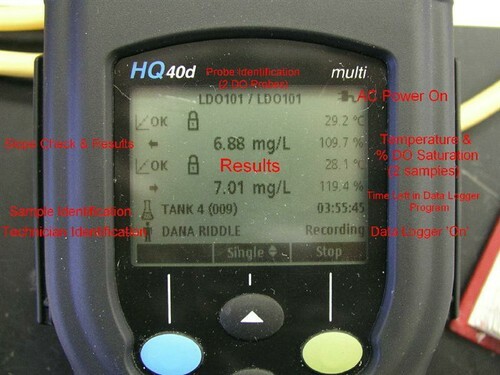 The HQ40d meter can record measurements simultaneously from two sensors (pH, DO, Conductivity) and each reading from each probe counts as one data set. It appears that Hach rushed their software to market. If you’re really interested in working with Comma Separated Values (.csv) files then you won’t be disappointed. The software for the HQ40d allows the user to import .csv files into Microsoft Excel™. At the time of this writing, it is not compatible with other programs. The software suffers from several deficiencies. For instance, data logged from two similar sensors (2 DO, 2 pH, etc.) are intermingled in a single column. Worse, the user has to write a formula to get a time and date on the spreadsheet! I must admit my experience with .csv files is limited and I might find an easier way to manipulate the data once I’m more experienced… but do I really want to learn an outdated program? Come on, Hach, you’re an international company, you can do better! Get some decent software out with graphing capabilities (look, for example, at Spectrum Technologies software for their data logger – that’s great software, but it isn’t compatible with Hach’s equipment). I checked with Hach’s technical support department and discussed the shortfalls of their software. The Hach representative said new software was in the alpha-testing stage and promised prompt answers to my questions after a pending consultation with their manager – and I’m still waiting 2 weeks later for confirmation that some improved software is on the way. I also sent an email to Hach’s Technical Support site with a copy of this review with no response what so ever, even though they claim all questions will have a reply within one working day. Hach Technical Support – is anyone home? In the meantime, I’ll struggle with the software’s existing version or manually enter the data points into Excel. The software is the major drawback in the Hach HQ series, but the ability to log data is a powerful resource (See Figure 3). So powerful that it makes me want to disregard sub-standard software and poor after-the-sale service. Figure 3. 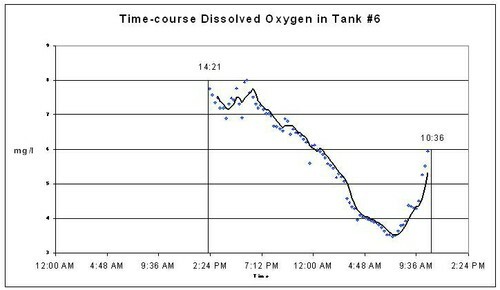 Actual data gathered by a HQ40D meter equipped with a dissolved oxygen probe. Though it takes some effort with the existing software to chart data, valuable information can be obtained with these meters’ data recorders. Hach advertises that a probe with a range to measure redox (at least those commonly seen in nature and aquaria) will be available in late 2006. The millivolt readings currently seen on my HQ40d when using the pH probe seem limited to Nerst Equation redox potentials, and is probably restricted by the range of the meter. Temperature is an important consideration when measuring pH, conductivity and dissolved oxygen and each of these Hach probes has an internal thermometer which will correct the measurements accordingly. Those meters capable of measuring dissolved oxygen have an internal pressure sensor and changes in barometric pressure are automatically compensated. The Hach literature is confusing in that it advertises automatic correction for salinity (0-70‰) when measuring dissolved oxygen. In reality, corrections are made only after salinity values are manually entered into the meter. This is easy enough to do but be aware that some data entry is required before automatic adjustments are made. Temperature can be reported in either ºC or ºF. Pressure is reported by default in the SI unit hecto Pascal (hPa), or alternatively inches of mercury (InHg), milliBar (mBar), or millimeters of mercury (mmHg). Backlighting of the meter’s display is a useful function when operating in dark or light-sensitive environments. Options include backlighting for various periods ranging from 10 seconds to 10 minutes, plus a ‘Never’ option. This flexibility can go a long way in conserving battery life where electrical power is not available. Factory default is set for 1 minute. Another energy-conservation measure is Auto-Shutoff, which is programmable in 7 increments ranging from 1 minute to 2 hours, plus the ‘Never’ option. Screen contrast is set by default at ‘5’, but is user adjustable from 1 to 10. Hach reportedly stands behind their products and offers limited warranties on its products (other than Customer Service questions, I’ve never had any reliability issues with any piece of Hach equipment I’ve owned). The LDO probe is said to come with a 3 year warranty, 1 year warranties on the conductivity and refillable pH sensors, and 6 months on the gel-filled pH electrode. As usual, the quality of Hach’s hardware is first-class and I expect many years of service from the HQ40. As with any piece of equipment, it has its strong and weak points. The DO sensor has some major advantages over the older polarographic method. Hach’s luminescent DO probe is ready to use once the meter is switched on (unlike older probes that require 15-30 minutes ‘warm-up’ time and must have ‘good’ water flow around and over the membrane). Hach’s DO probe can function in direct sunlight, a major advantage over the Ocean Optics fiber optic dissolved oxygen probe. The IntelliCAL™ DO probe requires an annual rebuild (it’s easy to do with the $80 rebuild kit). Those familiar with the older DO probes (such as the Yellow Springs Instruments and others) may recall the frustrations sometimes encountered in getting a bubble-free and wrinkle-free membrane on the sensor. The Hach procedure is quick and easy. Although the probes are factory calibrated, I prefer to check the probes against known standards. The IntelliCAL™ pH probe does not come with calibration standards (these must be purchased separately even though of the still photographs on Hach’s website clearly shows packets of calibration solutions along with the meter and probes, suggesting that they are included). The liquid-filled pH probe is not completely submersible. This is an inherent ‘problem’ with all refillable probes since the vent hole must be left open to allow flow of the electrolyte through the junction and across the glass membrane. The battery hatch can be a little tricky to remove and replace, especially when the meter is housed in its protective glove. It would be nice if the battery compartment were completely waterproof. Disregard Hach’s claim of ordering a ‘package’ (meter/probe combinations) to ‘save‘ money. Order the meter and probe(s) individually (as opposed to the packaged combinations) and you will truly save five bucks or so. In conclusion, I like the flexibility of these multi-meters and their potential associated cost savings (when compared to individually purchased meters). The data-logging functions have been very useful to me. In spite of the mediocre software, this meter and probes have allowed me to determine… Well, I’m getting just a little ahead of myself. We’ll discuss the findings in a future article. Dissolved oxygen (DO) is critical for the successful maintenance of oxygen-loving (aerobic) organisms. By the same token, control of DO is also critical in the support of anaerobic and facultative bacteria, such as those found in denitrators or phosphorus ‘luxury-uptake’ reactors. Since solutions containing high levels of dissolved solids are inherently less able to contain dissolved oxygen (with all a number of other factors being the same), DO levels, as a rule, will generally be lower in brackish or saltwater environments than in freshwater. Temperature plays a part – as temperature increases, the oxygen-holding capacity of water decreases. Biological loading also plays an important part in maintenance of proper DO levels. One fish in a large aquarium will exert a modest oxygen demand while many fish in a small aquarium might require more oxygen than is able to naturally diffuse into the water, thus creating a condition where artificial methods are required to supply the amount of oxygen to sustain life. In an aquarium, this takes on more importance at night (exactly when we are least likely to check dissolved oxygen) or when a power outage occurs and disrupts our artificial means of oxygen transfer. Standard Methods, 20th Edition (1998), lists five acceptable procedures for the determination of DO, including the azide method (“Winkler”) and the Membrane Electrode method. When this volume is revised, it presently appears as if at least one more method will be added – luminescence. ASTM has already approved luminescent determinations of dissolved oxygen. The luminescent method involves measuring the fluorescence of a reactive substance after irradiation with an excitation source. These elements are contained within Hach’s DO – ruthenium is the reactant, and a blue LED’s pulsed light is the excitation. 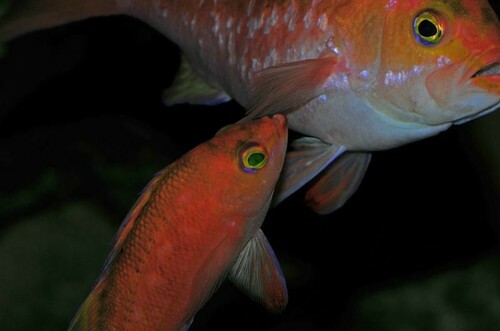 DO concentrations within an aquarium should ideally be as close to saturation as possible. It is possible for aquaria, ponds, etc. 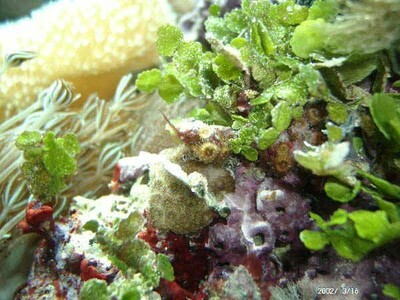 to exhibit levels above saturation due to oxygen generation by algal growths. However, DOs of about 7 mg/l are reasonable for saltwater aquaria, with saturation for freshwater higher at about 9 mg/l (depending upon temperature, barometric pressure and other factors). We can all probably recite the definition of pH we learned in junior high physical science class: It is a logarithmic scale indicating hydrogen ion concentration which, in turn, is indicative of the acidic or basic characteristics of the liquid. pH is one of the fundamental testing procedures, as many biological functions are pH-dependent. In the same vein, pH is temperature-dependent to some degree. Conductivity is the ability of water to carry an electrical current. ‘Pure’ water conducts very little electrical current. On the other hand, seawater – which is full of dissolved minerals and metals – conducts electricity very well. Generally, conductivity is used to monitor the performance of reverse osmosis membranes or deionization units. It is also useful for determination of dissolved solids in freshwater (a quick and ‘dirty’ determination of water hardness in lieu of testing for calcium and magnesium) and salinity of saltwater if appropriate correction factors are applied. Generally, organic compounds found in water contribute relatively little to conductivity – it is, again, generally inorganic compounds that are responsible. Temperature needs no introduction or definition, other than reef aquarium should be maintained within a range of about 22 to 27° C (72 to 81° F).